With the illegal blockade on Gaza nearing its eleventh year, more questions about the role of the UN and its humanitarian agencies in sustaining the blockade have been rising in the political arena. The government desperately wants not only to secure its northern border, but to remove Hamas from power. Recent talks between Cairo and Hamas regarding Mohammed Dahlan’s return to politics in Gaza reveal that the Egyptian government would rather see the man once accused of murdering Yasser Arafat in power than the democratically elected government. Dorit Naaman, film and media professor at Queen’s University, directed and produced an interactive documentary called, “Jerusalem, We Are Here”. The purpose of this project is to restore the lost or stolen homes, mainly in Jerusalem, of pre-1948 Palestine, if not physically then through the communicative power of art and new media. Until this day, houses are being demolished in Palestine adding another facet to the fact that the Nakba never ended. Acknowledging the existence of Palestinian homes, as this project does, is a form of resistance against cultural erasure. This interview highlights the importance of recognizing the past in Palestine, how it lives in the reality of our present, and challenges our future. Non-violent demonstrations by pro-Palestinian groups, such as chanting or protesting, are held as an act of solidarity for the Palestinians in crisis. In response, pro-Zionist organizations have begun to counter with claims that such pro-Palestinian demonstrations are anti-Semitic. This has produced a new dialogue that being pro-Palestinian is inherently anti-Semitic and in some cases resulting in lawsuits. The manipulated narrative of anti-Semitism is being employed by pro-Zionist groups as a smear tactic against pro-Palestinian groups in attempt to delegitimize the movement. It is difficult to say with certainty whether the smear campaign did or did not result in Rep. Ellison’s defeat in the race for DNC chairman. It is unlikely that a voting member would admit to being swayed by anything other than the candidates’ credentials, let alone a malicious attack. Regardless, one thing is certain: some of Israel’s most fervent supporters felt that the race was close enough to require discrediting Ellison. If Obama is genuinely interested in achieving a peaceful settlement to the conflict, upholding U.S. interests, and leaving behind a legacy consistent with his word, he should immediately recognize the state of Palestine. 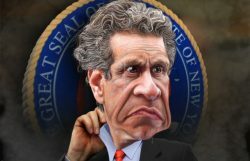 Governor Cuomo’s contradictory positions may seem illogical, but they are in fact quite rational. The governor is a Democrat and self-proclaimed progressive, but above all, he is a shrewd and ambitious career politician. In the wake of Trump’s victory, the world waits with trepidation for what 2017 will bring to U.S. domestic and foreign policy. The future is uncertain for Palestinians and Black Americans, whose parallel struggles have become increasingly highlighted in the last few years.